Vegetarian style foods from Jamaica are rated among the best of the best in the Caribbean. And because of that, many of our patrons at our restaurants asked for these types of recipes all the time. And rightly so, after all Jamaican vegetarian foods are delicious and easier to digest, and I might add, inexpensive. The rising food cost may have been a factor why we had these type of meals two to three times a week when I was a youngster, but I can’t say for sure that that was the reason. Whatever the facts are, I have been fed with wholesome and delicious all natural foods. We had callaloo, ackee, seasoned rice, steamed cabbage, pop chow (bok choi) and more. Our daily diet consist of a variety of yams, rice,grains, fruits, and potatoes. The way we thought about food was unconventional too, in that we interchanged the definitions of food when we feel like doing so. A fruit would be referred to as a vegetable and vice versa. For example, a bread fruit is never seen as a fruit, tomatoes are seen as vegetables, and so on. As far as I can remember, we never use the term “vegetarian” when describing our dishes. It was always understood that you use what was available, what you ate was up to you. There was never any competition among any of our culinary delights. And to think of oneself as a “strict anything” was unheard of. We just knew that varying our diets was the best way to eat and stay healthy. Even the Rastafarians, who usually stick to an all natural diet used processed foods in their meals, sometimes. And speaking about Rastafarians, my friends I invariably end up at the Rasta Camp along Old Harbor Road, Sydenham, on any given day. Why? You asked…the Ital Food, What else? Well...other things too, but we will not get into that. The Rasta Camp was managed, so to speak, by two young men who had left the corporate world to live an all natural lifestyle; the pursuit of inner peace, and a true path to the Most High. They, Ras Lloyd and Ras Owlie, were intellectually superior and had academic achievements coveted by many. That made them a dangerous duo, because some of the older folks passed them off as intellectual kooks. But the dreads were not interested in what the society at large thought about them, after all, that behavior was common in the 1970’s. It's strange how the Rases were never accepted by the local community, and you can imagine the warnings we had from parents, elders, and the rest of the “more moral than thou” clique. "The Dreads," Ras Owlie and Ras Lloyd, made the best Ital food back then; my friends and I ate a lot of this food and then learned to cook like this, watching Ras Lloyd. We used to practice our cooking craft on the canal banks behind my friends yard all the time. And yours truly was the designated "cook." The verdict from the old folks was… that kind of vegetarian food (Ital) will make you lazy. However, my friends and I knew that was utter rubbish. By the way, some of these same people are now eating Ital food under different names like Organic, Health Food, or Natural Food,…you know, names the the marketers come up with to tame the skeptical few. That’s justice…served lukewarm in this case. What is Ital food anyway? Ital food is a variety of vegetarian foods made without using animal products, sugar, and/or salt. These vegetarian foods are sometimes so hot and spicy, you forget about salt when you taste them. For example, the Ital Rice and Peas is dominated by the oil from the Coconut Milk and Scotch Bonnet Peppers. Yes, the oil traps the flavor and heat of the peppers and gives the food an aroma and taste that will wake up your sinuses. Now don’t get me wrong, some Ital (vegetarian)foods are unique in their own way and would not be classified in the strict sense as usual Jamaican vegetarian traditional food. I think that’s a good thing, anyway you look at it. 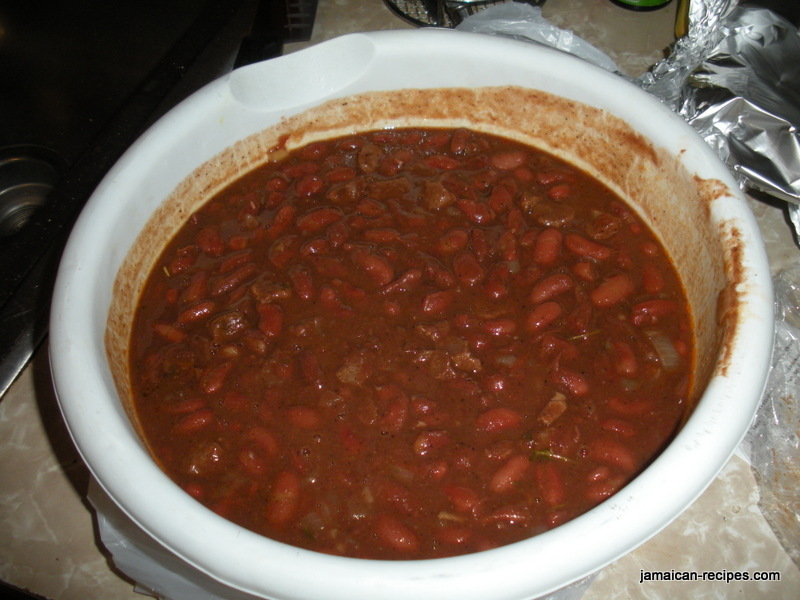 And if the vegetarians followed the usual way to cook Jamaican vegatarian foods, that would not be Ital. Because Ital is strictly a salt-free meal. Yah Mon! Nowadays tofu has joined the list of ingredients used in Ital food preperation. And now the name Ital is substituted by "vegetarian" in some sectors of society. What can I say… Yah Mon!!! In a frying pan, sauté onions and tomatoes until onions are soft. Don’t burn the onions. Open the can of ackee and pour the brine off. Add ackee to onions and tomatoes and fold together. Let the ingredients cook for 2 minutes, and then add salt to taste. Add black pepper and let simmer on medium low for another 3 minutes or until desired. You can serve this with Rice, Bread, Breadfruit, or Yams and Potatoes. Use same ingredients as above, omit black pepper. Wash callaloo thoroughly to remove dirt and foreign matter. Use the same method as laid out above. Add callaloo to the sautéed onions and tomatoes, and then turn the fire down between medium and low. Cover the pot with the cover and let the vegetables steam slowly. Wait 5 minutes, and then fold in the vegetables, the callaloo should be soft by now. If not, cover the pot and let simmer a little longer until soft. If you would like to make any of these dishes Ital, do not use salt. Instead, use a chopped and seeded Scotch Bonnet Pepper where salt is required. Boil 1 lb. boneless salt fish in a saucepan with fresh water. When the fish is cooked, pour off water. Pour fresh cold water onto the fish and remove the skin, if you bought skin on cod fish. Pour off cold water and then flake the fish with a fork. Add the fish to the sautéed onions and tomatoes before adding ackee/calllaoo respectively. Watch out how you apply the salt. Although the salt is cooked out of the fish, a significant amount of it still remains. 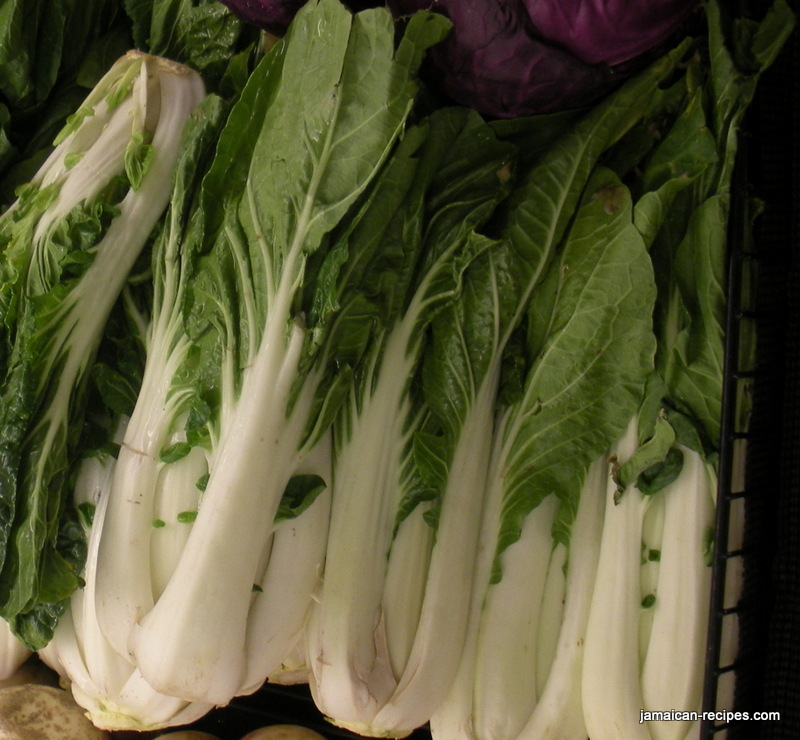 Wash bok choi to remove the dirt that’s usually found in the root area. Chop bok choi into 1/8” pieces (don’t measure it just estimate). In the meantime you can sauté the onions, tomatoes, and garlic together. Add bok choi to the ingredients in the pot, and then add about 2 tbsp of water. Now add salt and black pepper. Cover the pot and let the bok choi steam until soft. Taste the stew; it should have a taste like it is ready, now add the ginger and thyme. Turn the fire to low and let it simmer some more for about 3 minutes. Serve with white rice or bread. And like I said before, you can make any of these vegetarian dishes Ital by omitting the salt. Just imagine once or twice a week having delicious Jamaican vegetarian foods, without salt; that's healthy mon!